This is the Spektrum DX3E DSM 3Ch Surface Radio. Revolutionizing the industry yet again, Spektrum announces their most affordable 2.4GHz system ever offered. 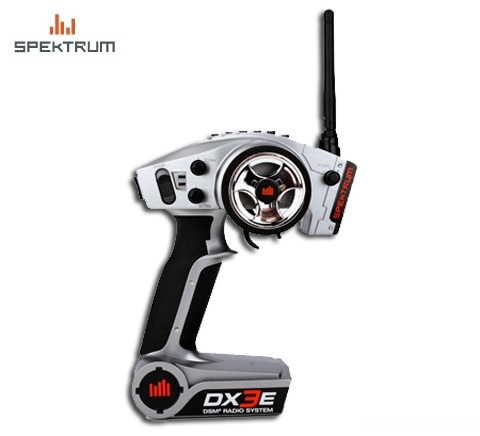 Packed with features and added value, the DX3E is just what consumers have been asking for. At $99.99 MAP, it’s tough to beat this easy-to-use system- modern Spektrum styling, interference-free driving, and added features such as battery indicator LEDs and steering dual rates plus compatibility with all Bind-n-Drive vehicles. 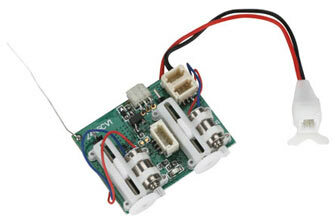 Compatible with DSM2 and the MR3000 receivers, in addition to DSM surface receivers. Spektrums new AR6400 is a 6 channel ultra micro receiver with integrated servos, speed control and ParkZones X-Port technology. The AR6400 is designed for ultra-micro and ultra light foamy aircraft. Featuring DSM2 technology the AR6400 is compatible with all Spektrum, JR, E-flite, ParkZone 2.4GHz DSM2 transmitters. 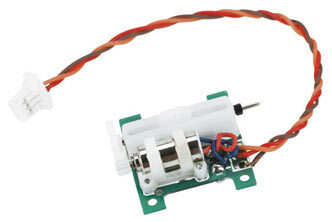 This little unit is super light weight at under 4 grams making it the lightest receiver servo and esc combo in the RC market. Although this is a brushed ESC, you can always connect the micro ESC from HobbyKing XP 3A 1S 0.7g Brushless Speed Controller.